Queen's University Belfast invests in education with AV technology for medical biology centre. As one of only seven British teaching establishments to have resisted the switch to medical models for anatomy, Queen's University Belfast could be deemed traditional in its teaching methods. Whilst the use of cadavers for dissection dates back to 1819, when James Lawson Drummond, Chair of Anatomy and Physiology at the Royal Belfast Academical Institution, introduced anatomy within the Faculty of Arts, the use of technology at the University today is truly 21st century. When the dissection room in the Medical Biology Centre opened its doors for the new academic year in September 2015, it did so equipped with 18 Full HD 65-inch multi-touch LCD displays. The LFB70 series of professional Full HD displays incorporate intuitive touch screen technology, fully interactive whiteboard functionality, and the very latest in wireless connectivity to allow the students to work more closely as a team. Built-in whiteboard software allows students to turn on the display and start work right away—no need to connect a PC. Up to four people can write at a time, and they can save pages and email them directly to themselves for future reference or to share with anyone who missed the lecture. Notes can be made on almost anything, from video and photos to presentations and PDF documents. Stuart Ogg from Media Services at Queen’s commented, "We needed a world class facility, capable of covering a multitude of teaching modes in a specialist environment. The brief was extremely broad." "The lab has proven to be a truly interactive space. Staff tell us that their teaching has been completely transformed and students are actively engaging with the technology." "The support we received from Panasonic Ireland was first class, they worked closely with us from initial conception through to completion, their input was invaluable." In addition to office tools and the whiteboard technology, the displays take a feed from the central teaching island, where the lecturer can transition between a desktop visualiser, a ceiling mounted fixed HD camera, as well as PC and tablet feeds. 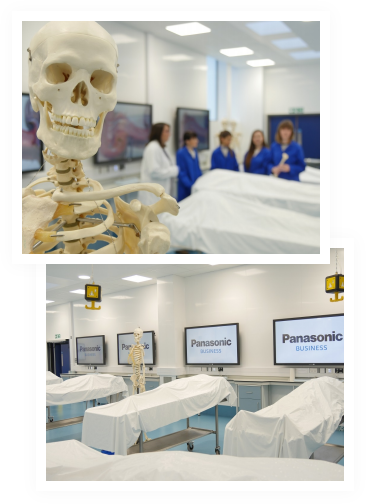 It means that 130 students can watch a live demonstration on the screens whilst simultaneously following the steps on the cadavers positioned adjacent to the displays. Additionally, the students use Miracast™ technology to transmit documents, Full HD video and images from compatible Android devices and Windows PCs to the displays. This means it’s easy for everyone to contribute without worrying about cables or connection speeds. 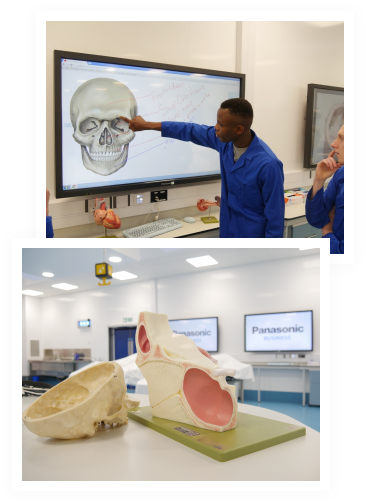 Samantha Taylor, Lecturer (Education) and Anatomist at the Centre for Biomedical Sciences Education at Queen's University Belfast, said, "Using the interactive whiteboards gives the students a chance to be engaged and be interactive. We can project images aroun the room and the resolution is fantastic. "I had no idea about how versatile this technology would be"
“I had a picture of how it would look and what we have got now has far exceeded my expectations. I had no idea about how versatile this technology would be, once I started using it I loved it and I’m now thinking about different ways of engaging students. For example, I put crosswords together and I get students to complete them as a group which makes learning fun. Among the challenges of a modern day University are how to attract external funding and how to attract students from home and abroad. Future plans for the dissection room include livestreaming lectures to the University’s internal web infrastructure, and several companies have approached the University to run cadaveric procedural courses for a number of surgical specialities. “I’ve been to a number of other dissecting rooms and I’ve seen nothing like this, and I haven’t actually heard of this being in existence anywhere else, which makes the School very attractive,” added Samantha Taylor.